When you spot the season’s first snowflake falling from the sky, do your thoughts turn to the bracing rush of wintery outdoor pursuits? Or do they drift more to cozy indoor hibernation? Whatever your inclinations, even the winter lovers among us risk running out of ideas by mid-January. 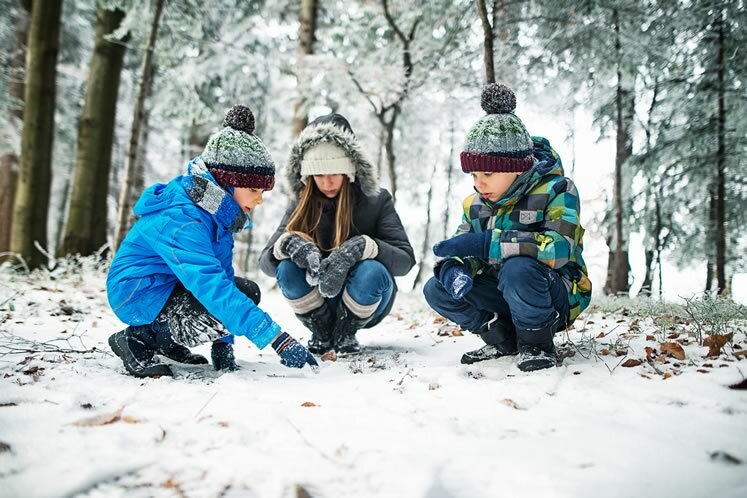 For parents and caregivers in particular, the snowy season can induce planning panic, not to mention cabin fever. No matter what the temperature here in these hills, there’s endless fun to be had. Read on to find out about ten of our favourite ways to kick-start the season and keep the good times rolling. You can find more information about all these activities below. Cross-country skiing is a sport for all ages at Monora Park in Mono. Photo by James MacDonald. Headwaters is packed with activities for skiers. Whether you want to commit to a membership, suss out public weekday or weekend skiing, or sign up for a season of lessons, Mansfield Ski Club in Mulmur, Caledon Ski Club near Belfountain and Hockley Valley Resort in Mono offer great options. 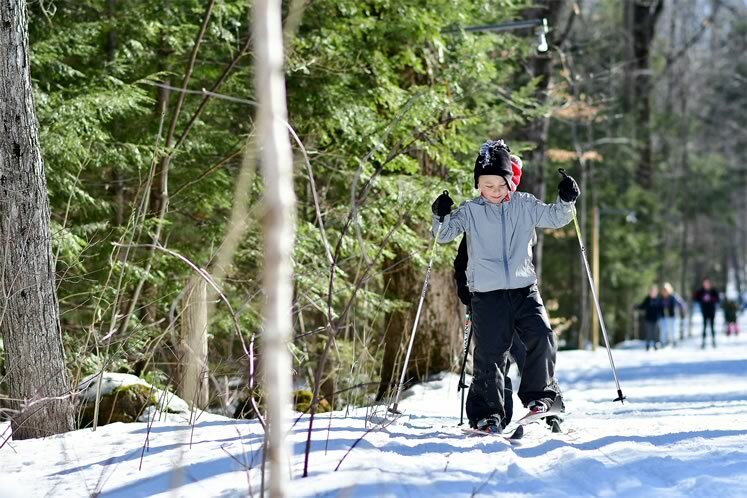 If picturesque paths are more your thing, kids are also naturals at gliding on cross-country skis. Even the little ones can cover significant ground before getting too tired. Remember to wear sweat-wicking base layers, as this is an aerobic activity! 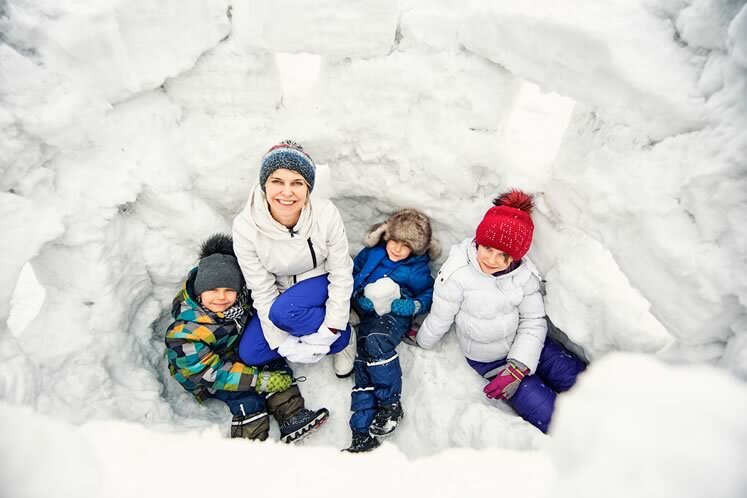 Snow forts are perennial boredom-busters. Photo by Imgorthand / Istockphoto. Can’t get the kids to go outside? Just say the word “fort” and they’ll be racing to pull on boots and mittens. Fort building is one of professional outdoor enthusiast Sam Shepherd’s go-to activities. With her husband Dave, Sam owns Escarpment Outdoor Adventures in Erin where they offer programs such as outdoor adventure camps, hiking and yoga for local kids. If creativity begins to wane, extend the vibe with a round of “snow-ga,” which Sam, a certified yoga teacher, says is a great boredom buster. Find the distinctive tracks of a cottontail rabbit. Whether it’s on a stretch of the Bruce Trail or in the woods on your own back 40, gather up the little ones, slip on some hikers (consider strapping on cleats if it’s icy), and set out on a different kind of hike, this one attuned to wildlife. Don Scallen, In The Hills’ resident nature expert, created this thoughtful challenge for us. You’ll need to take along a measuring tape, pencil and notebook for older kids. Print these instructions for tracking rabbits. Watch for tracks in the snow and keep your eyes and ears open for birds in the forest. The woods are full of blue jays, cardinals and other birds that overwinter. 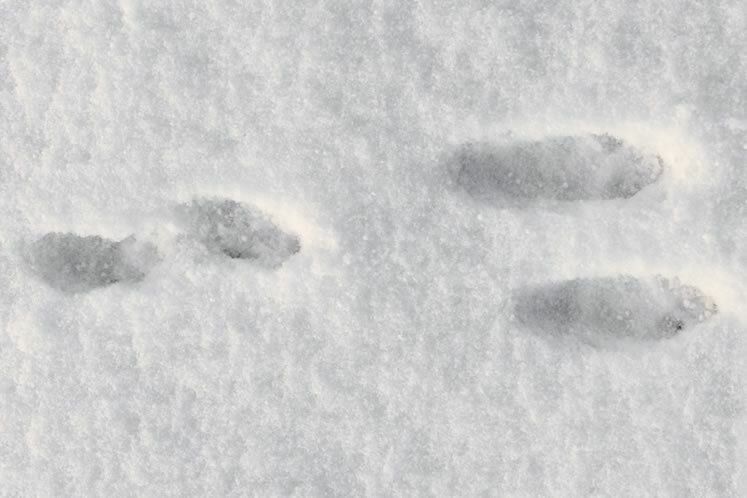 Find the distinctive tracks of a cottontail rabbit (see photo above). Follow the tracks to discover what the rabbit was up to. See if you can find where the rabbit rested. This shallow depression is called a form. Look for its droppings. They might remind you of Cocoa Puffs cereal, says Don. Examine branches along the rabbit’s path. Branches are rabbit food, at least in winter. Any cut on a sharp 45-degree angle has probably been bitten by the rabbit you’re tracking. With a measuring tape, see how far apart the tracks are. This distance is called the stride. A 20–30 cm stride (about 8–12 in.) probably means your rabbit was calm and unhurried. An 80–100 cm stride (about 31–40 in.) means your rabbit was really stressed out. It may have been on the run from a predator such as a coyote or red fox. See if you can piece together a story about a day in the life of “your” rabbit. Take kids on a walk with purpose and look for cottontail tracks. Photo by Imgorthand / Istockphoto. If you’d like to find your footing with a regular hiking group or just sample new bunny-worthy trails, consider going on an introductory hike with the Dufferin Hi-Land or Caledon Bruce Trail Club. Both groups offer organized hikes of varying lengths and levels of difficulty. 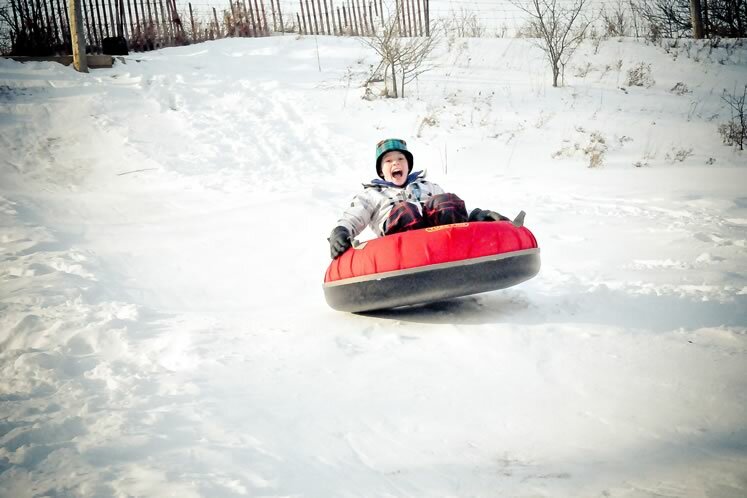 Try out snow tubing at Teen Ranch. Photo courtesy Teen Ranch. Snow tubing is a happy mash-up of tobogganing down a hill and tubing behind a boat on a lake or free-floating on a river. 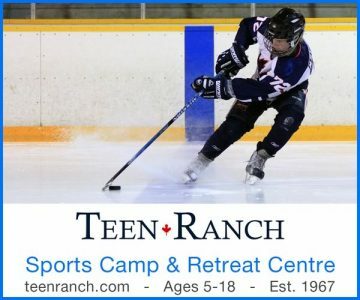 Teen Ranch, just south of Orangeville on Highway 10, has the perfect hill for kids to navigate inside a big squishy tube. Sure, they have to carry the tube back up the hill, but their grunts of exertion quickly give way to the next whoops of excitement. From personal experience, I’d say tubing is the highlight of Teen Ranch’s winter PA Day and holiday camps, as well as its Family Day programming – when adults can launch themselves down the hill too. Tubing is also on the activity list if weather permits during a mini-sleepaway camp featuring three days and two nights of fun during March break. There’s a PA Day camp on Friday, January 26. Day camp runs from Tuesday, January 2 to Friday, January 5, and children can join for just one day or all four. Family Day is Monday, February 19. 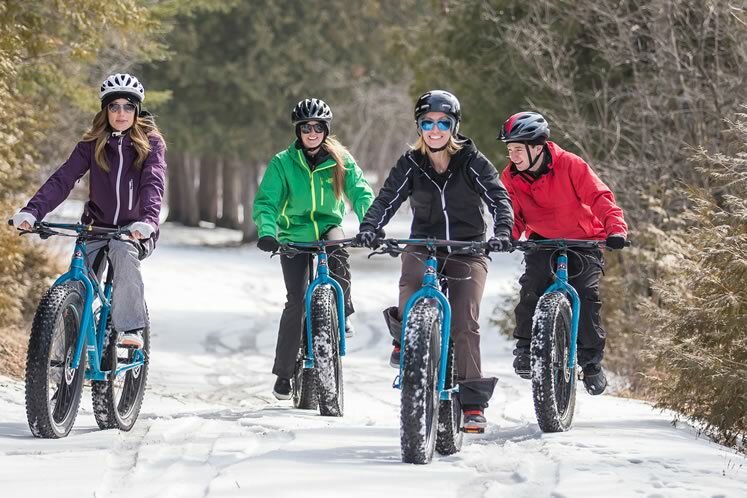 Try out winter’s latest fix– fat biking at Albion Hills Conservation Area. Photo courtesy Central Counties Tourism. If you consider mountain biking a summer sport, think again. With the fat bike trend gaining traction – picture hefty mountain bikes with even gnarlier tires – cyclists can now hit the trails any time of year. Snow and ice are no deterrent to 8- to 13- centimetre wide tires with extra grippy treads. Bonus: If you’ve got bored tweens and teens, fat bikes are downright cool enough to try out with mom and dad. You can rent bikes at shops such as Caledon Hills Cycling in Inglewood (they also offer great family ride maps on their website). Or head to Albion Hills Conservation Area in Palgrave, where they offer mostly adult sizes and a couple of smaller sizes suitable for kids about 120 centimetres (four feet) tall. Helmets are mandatory in conservation areas and common sense everywhere else for noggin safety. Albion Hills features eight kilometres of winter fat bike trails for a perfect way to spend a winter’s day. Visiting a sugar bush, such as this one at Island Lake Conservation Area, is one of winter’s last pleasures. Photo by James MacDonald. After a long winter, sugaring-off season is both a sign spring is on the way and a chance to give one final nod to winter. If you visit a sugar bush on conservation land, it can also be one of the most multidisciplinary activities going. We’re fond of the events at Terra Cotta Conservation Area and Island Lake Conservation Area on the outskirts of Orangeville. 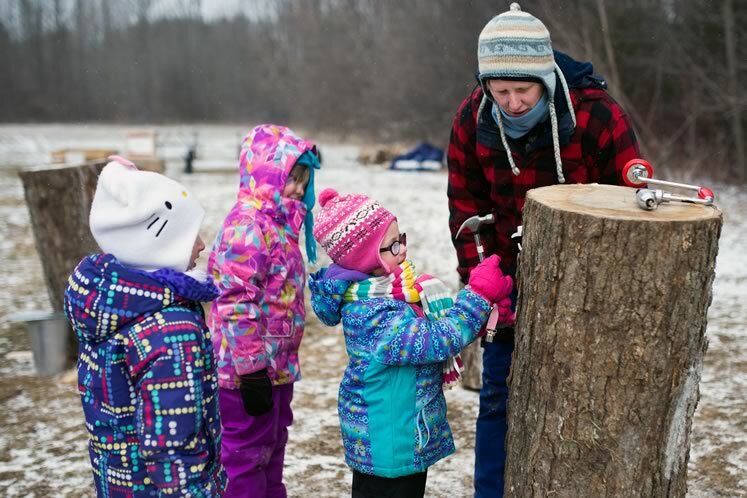 As part of the Sugarbush Maple Syrup Festival at four conservation areas in the GTA, kids – and grownups – who visit Terra Cotta and Island Lake are treated to the kind of programs offered to school excursions. You’ll learn about the history of First Nations and pioneers in the region and how they made syrup. 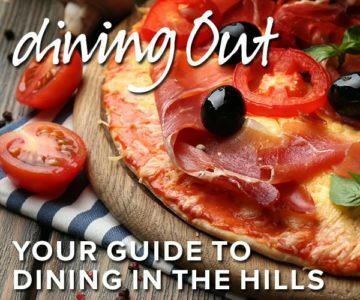 You’ll also get a crash course in the science of tree sap and the local ecosystem. Add a dash of physical activity as you traipse along paths and check out exhibits and, of course, the celebratory any-time-of-day meal of pancakes and homemade maple syrup, and you’ll have a family with rosy cheeks, full bellies and happy memories. 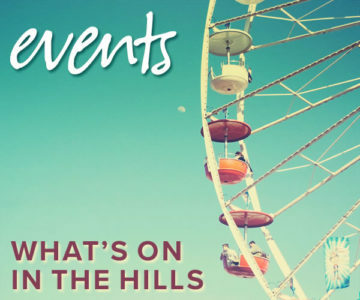 These events happen when the weather is just right, usually starting in early March. 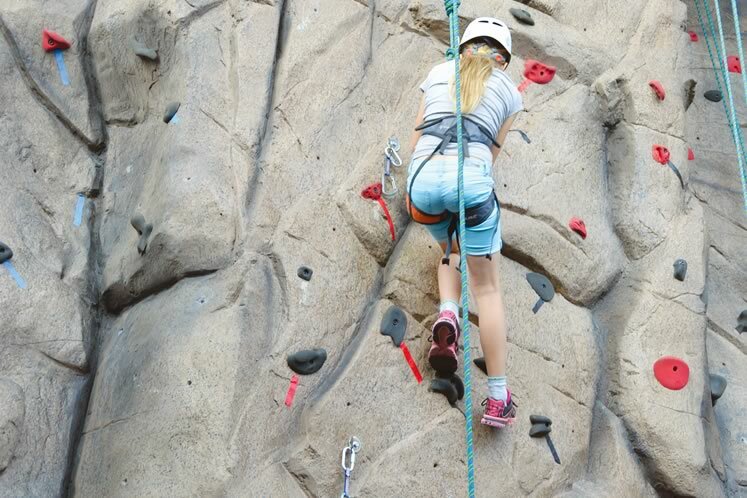 Let the kids climb the walls at the Caledon Centre for Wellness and Recreation. Photo courtesy Caledon Centre for Recreation & Wellness. If the kids are climbing the walls at home, you can turn that metaphor into reality – and save your sanity – by taking them to a real climbing wall. The Caledon Centre for Recreation and Wellness in Bolton, for instance, boasts a 9-metre rock wall suitable for all levels and abilities. Closed-toed running shoes and comfortable clothing are musts, or you can borrow rock wall shoes. The friendly staff will help the kiddos get helmeted, harnessed up and ready to scrabble up the ersatz Everest. Drop-in rock climbing is available Saturdays and Sundays from noon to 4 p.m. and Mondays and Wednesdays from 5 to 9 p.m. Or consider hitting the wall during Family Fun Nights on Fridays from 6 to 9 p.m. (with a side order of ping pong, foosball, billiards and video games). Families can test out new board games for free on Wednesday nights at Orangeville’s Koros Games. Photo by James MacDonald. Need to cure a case of the indoor blahs? There’s a game for that. For starters, there’s no reason to keep goofy party games for special occasions. Our kids adore Shake the Sillies Out. You’ll need a tissue box with the plastic removed or a box with a similar-sized rectangular opening. Tie a belt or tie around a child’s waist to attach the box to the lower back, with the opening facing out. Fill the box with ping pong balls. Here’s the challenge: The child has one minute to shake his or her tush to try to get every last ping pong ball out of the box! Or combine play time and snack time with the Oreo Face Challenge, in which children stick an open-face Oreo (or Girl Guide or any sandwich cookie) to their forehead, then wiggle their faces to inch the cookie down to their mouth. No hands allowed. If the kids are mellow enough for an actual board game, dust one off. Or seek inspiration at Koros Games in Orangeville. 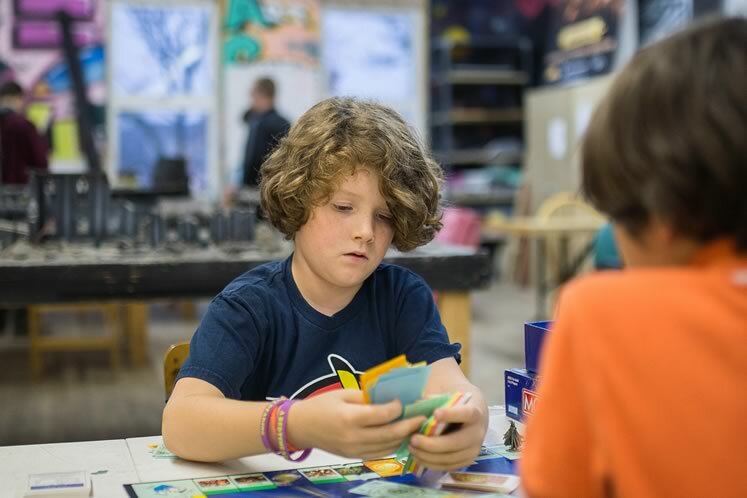 Some games are always open and on hand to allow customers to check them out and play a round or two, but if you want to settle in for the long haul, swing by for Family Game Night on Wednesdays between 5:30 and 8 p.m. They focus on a new game every week. Orangeville’s Alder Street Recreation Centre features a zany inflated obstacle course on Sundays. 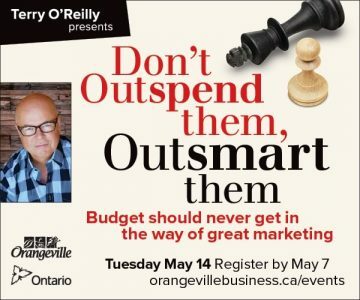 Photo courtesy Town of Orangeville. Neighbourhood pools appear to be taking a page from those massive indoor water parks your kids clamour to visit. This is especially good news if you’d rather not take a road trip or spend big bucks for some aqua fun. Check out the pool at the Alder Street Recreation Centre in Orangeville. It’s one of the most requested outings in my family. There’s a kid-friendly (read warm) leisure pool complete with therapeutic bubble jets, as well as a 4-metre water slide, buoyant mats, balls and water toys. 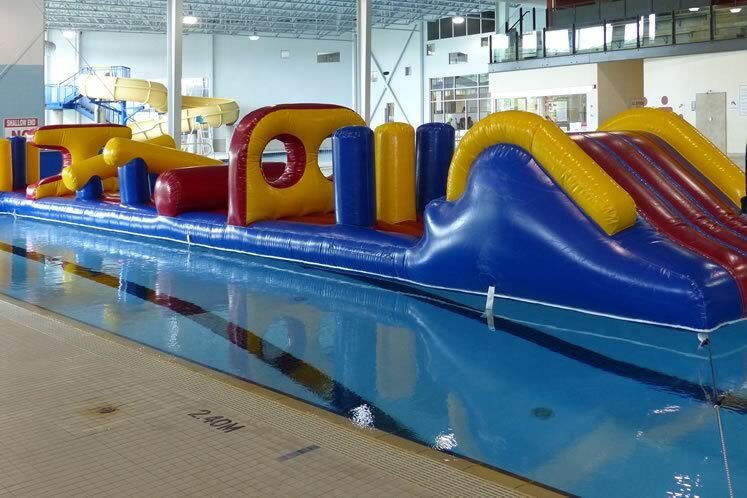 But the pièce de résistance is the new Aqua Dash & Splash course, available Sundays from 1 to 2 p.m. A 15-metre gauntlet, made up of inflated hurdles, logs and other obstacles, floats on the water and culminates in a final floating slide sure to induce squeals of joy. To use the Dash & Splash, swimmers must be at least six years old and pass a deep-water swim test. 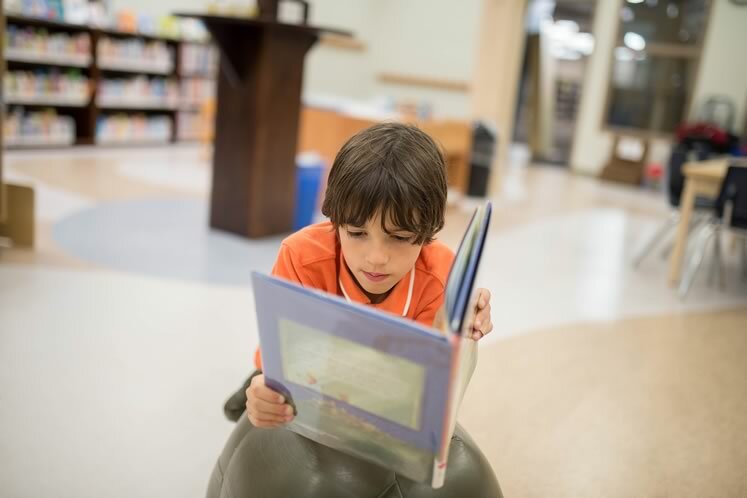 Don’t forget your local library for books, Lego builds and puppet theatres to inspire little ones, like those at the Orangeville Public Library. Photo by James MacDonald. 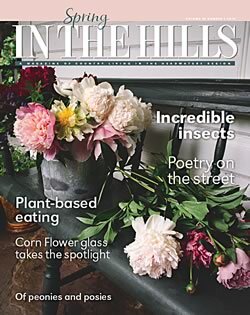 Though some of the best times at the library are all about random reading discoveries, libraries throughout the hills now offer much more. The Shelburne Public Library and Orangeville Public Library’s Alder Street branch, for instance, host drop-in Lego builds. And for a new hook on getting kids to practise reading aloud, parents can schedule a time with the Paws to Read program, which encourages children to sit down and read to a therapy dog. The Grand Valley Public Library hosts monthly teen “cafés” on Saturday nights. Over at the Mill Street branch in Orangeville, gigantic children’s book spines fit for a theme park make up one wall in the kids’ area. A puppet theatre and seasonal crafts are also on offer.